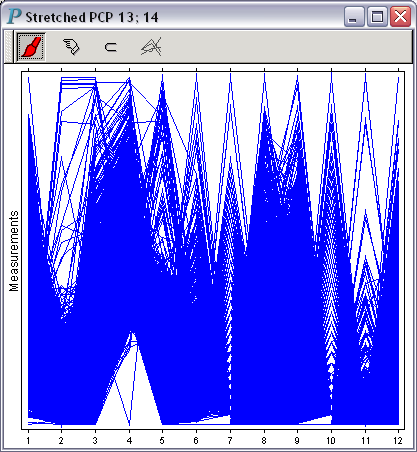 This parallel coordinate plot uses a common vertical range that encompasses all the values of all the variables being visualized. 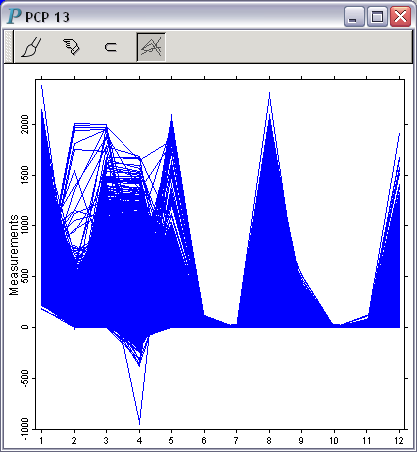 Each axis in this parallel coordinate plot uses a different scale so that the minimum and the maximum values of the variable represented by an axis are mapped, respectively, to the bottom and the top of the available drawing room. Panmo uses parallel coordinate plots as the launch point for several utilities that help users find similar or dissimilar observations. Acknowledgements: Data courtesy of Invitrogen. Copyright © 2001-2019 The Chi-Square Works, Inc.